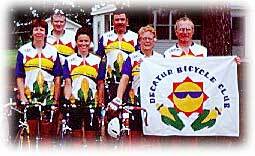 The Decatur Bicycle Club is a bicycle touring club serving Decatur, Illinois and Macon County area. Our feature event is the Amish Country Tour held each Fall. Rides are scheduled 7 days a week. They usually average 12-15 mph and are 8 to 30 miles round trip. We also have longer rides on weekends and sometimes have cycling weekend trips. Our ages range from 20's to 70's and families are welcome! We are interested in accommodating new members. We want to get to know YOU! Copyright 2001 Decatur Bicycle Club, Inc.